The Drs. 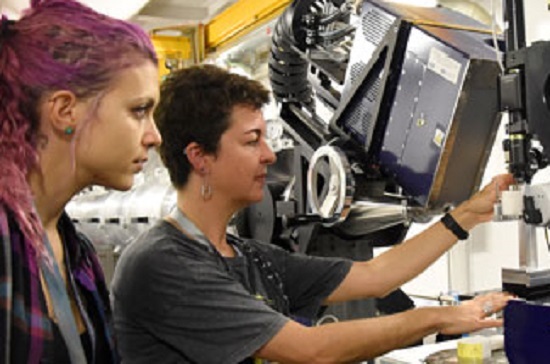 Amparo López-Rubio and Marta Martínez-Sanz, researchers of the Packaging Group, of the department of Preservation and Food Safety of IATA, have been working in the facilities of the ALBA synchrotron analyzing biopolymers that can be obtained from biomass, such as algae. This group investigates the development of more sustainable ways to produce food containers with adequate mechanical and chemical properties. Scientists have analyzed how adding different species of microalgae can modify the properties of starch-based biopolymers. The results show that the microalga of Spirulina is a promising alternative to replace part of the corn starch matrix of biopolymers , since it improves the properties of oxygen barrier and water vapor, thus maintaining the food in better conditions. The use of microalgae offers advantages based on the fact that they proliferate very quickly, grow in a wide variety of environments and do not interfere with other foods. In addition, the production of these biopolymers can be easily scaled and applied in industrial processes.